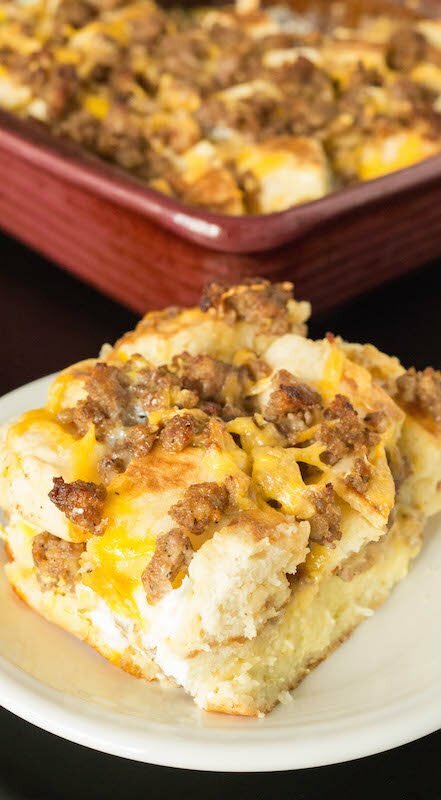 This breakfast recipe turns the classic flavors of a Sausage Egg McMuffin (sausage, egg, cheese, and English muffin) into a delicious breakfast casserole. You can prep the night before and toss in the oven the next morning for an easy breakfast. The Sausage Egg McMuffin is undoubtedly one of the most iconic fast-food breakfasts of all time. It’s cost-efficient, has magical hangover-healing properties (allegedly), and the savory blend of flavors never fail to please. The only thing that could take the Egg McMuffin to the next level is turning it into a breakfast casserole. Good news: I’m on it! I made this Egg McMuffin Casserole the first time because some friends had rented a beach house down in Laguna for the weekend. They invited me to come under one condition: that I provide them with a super delicious breakfast. Not too uncommon of a request when you’re a food blogger. I’d say it got the job done because there wasn’t a single crumb left! Breakfast casseroles are usually best if you prep them the night before, which works out great because in the morning all the work is already done! Just pop it into the oven and lounge on the couch drinking mimosas until it’s ready. 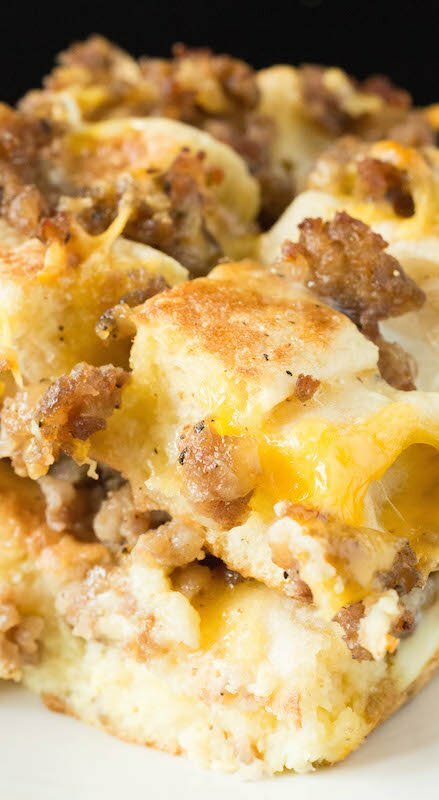 To make the Egg McMuffin Casserole, layer cut English Muffins, cooked breakfast sausage, and cheddar cheese in a deep 8×8 baking dish. Then pour the egg and milk mixture evenly over the entire casserole. At this point, you want to cover the Sausage Egg McMuffin Casserole with saran wrap and store in the refrigerator for at least two hours. I prefer to let mine soak up the creamy egg mixture overnight. I like to top mine with maple syrup, which sort of turns it into a McGriddle. Janette prefers to douse hers in ketchup. This horrifies me but to each her own. 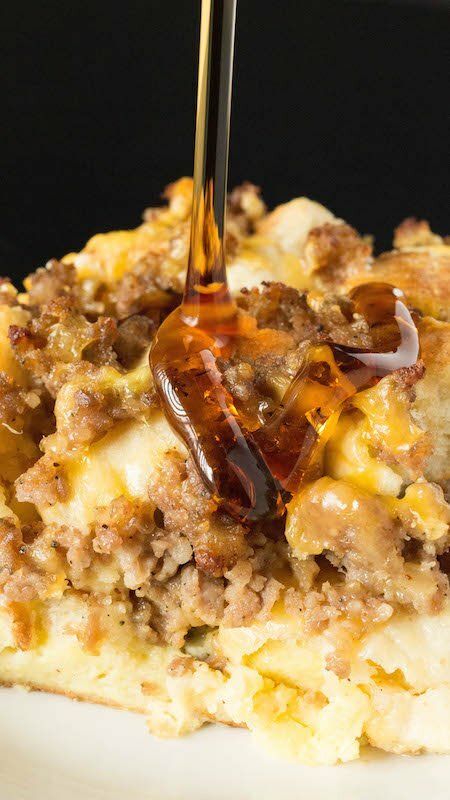 Whatever condiment you choose to adorn your McMuffin Casserole with, I hope you enjoy it as much as we do! Grease an 8×8 baking dish with non-stick spray. Place half of your cut English muffins into the bottom of the dish in a single layer. 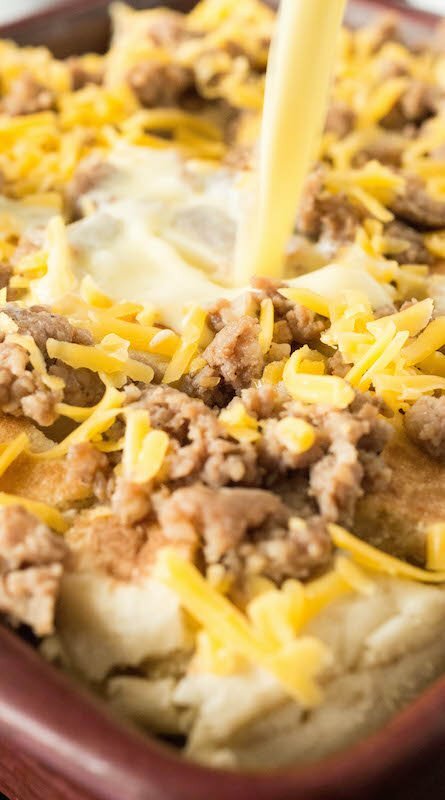 Cover then English muffins with half of the cooked breakfast sausage, then layer with half of the cheese. Add one more layer of English muffins, another of sausage, then the cheese. In a bowl, whisk together the eggs, milk, salt, and pepper. Pour evenly over the casserole. Bake 40-50 minutes until center is cooked through. I love these breakfasts that will feed a crowd or you can take along to a family brunch! Thanks for sharing! Oh my! This looks sooooo good! I love the idea of using English muffins and making it the night before. Sounds great! My boys will love this for weekend breakfasts. Thanks for such a great recipe. Though, I don’t eat sausages .., but I often cook with it for my kids. I can so see why this would be an alleged hangover cure. 🙂 Protein and carbs. Perfect. 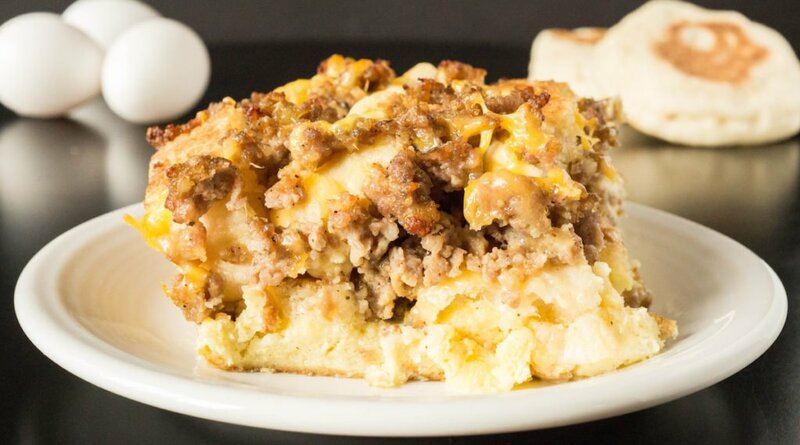 But besides that, this sausage egg mcmuffin casserole looks so delicious! i love how simple this is…and will work great for serving a crowd. Magical hangover healing properties – love it! This sounds so tasty. Totally saving this recipe for my next breakfast-y food craving. This looks so good and I don’t even like eggs! I guess I will have to make this for my son. I know he will love it. Such a good, and super easy, breakfast! I really like the breakfast casserole for a crowd. Breakfast that feed a crowd.. Perfect for the weekend brunch. I love English Muffins and Sausages.. This looks like a winner! This. Is. BRILLIANT! 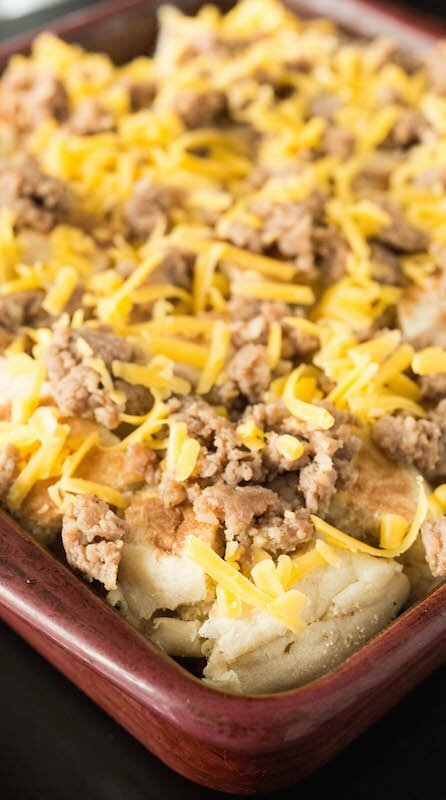 I love the idea of turning my favorite fast food breakfast into a homemade casserole, and I have no doubt this recipe is gonna get some mileage in my kitchen. YUM. Oh my goodness, this recipe sounds amazing! Love all these ingredients! I’m going to have to give this a go! Would this work go double the recipe and make in a 9×13 pan? Yes, that sounds like it would work great Angie. An easy way to feed even more mouths! I have not tried, but I don’t see why it wouldn’t work. Let me know how it goes if you try it! 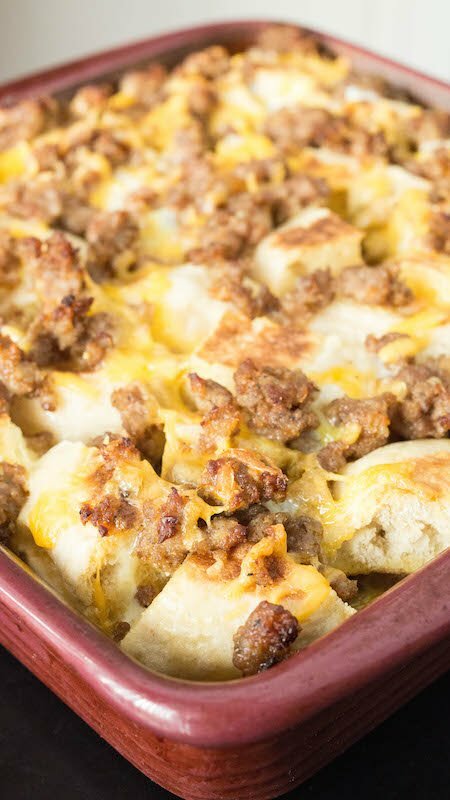 Crockpot Overnight Breakfast Casserole recipe is a classic make ahead breakfast casserole with eggs, sausage, bacon, hash browns, and cheese, Great for the holidays and a crowd. Looks amazing!! Can’t wait to try it!! Can this be made with bacon or ham and biscuits instead of English muffins? I don’t see why not, Ann. You’ll have to let me know how it turns out! I make such a mess when I try to eat these as a sandwich – making it into a casserole instead makes perfect sense! I make this for my family and friends pretty regularly, and they all looooovvveee it! Thanks so much for this recipe. Outstanding Janica! Increased the recipe for a 9 x 13 pan. Everyone was saying it was the best they’ve ever had. Thanks for sharing. I’m going to make it for our office party. I made this and I am soooo happy I did! I didnt use as many english muffins tho, I used a single layer twice. I also used 1lb of homemade sausage, (all I had was ground pork). There is only the two of us now but I want more. I will double, or make two next time.